Dr. Eskow is a prosthodontist at NOVA Prosthodontics in Fairfax, Virginia, with colleagues Brian A. Mahler, DDS, PLCS and William Wilson Jr, DDS, MS. We are conveniently located off Chain Bridge Road near Route 66 in a residential neighborhood with plenty of on-site parking in our private parking lot. 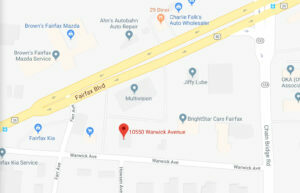 The office is located at 10550 Warwick Ave, Fairfax Virginia. Hours are Monday – Thursday 9:00 a.m. – 5:00 p.m.
We are pleased to assist our patients in the filing of insurance claims. We do, however, request payment before services are provided. Your insurance company will be instructed to send the reimbursement check directly to you. We have intentionally chosen not to be on any preferred provider insurance lists because we would be unable to provide the quality of care that you deserve. This ensures that we will provide you with the best dental materials, not the cheaper ones. We will provide you with services from the best dental labs, not the overseas ones. And we will be able to spend the amount of time with you in order to provide you with the best possible dental services; and these dental services will be dictated by you, not the insurance company. What dental lab do you use? 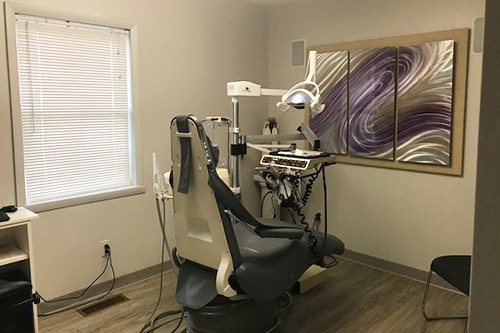 We have an in-house state of the art dental lab that we use for most cases. Our technician is available for custom shade matches. We offer same-day dentures repairs and All-on-4 repairs. We also have an in-house 3-D scanner so that we can design customized prostheses specific for each patient. Occasionally we will use other boutique labs for specialized services. As a prosthodontist, Dr. Eskow understands all aspects of dental laboratories and will choose the technician who will be best for your specific needs. We value the highest caliber work, and we do not send to discount labs. Are you like Clear Choice? You may have seen ads for ClearChoice on the television – they use the All-on-4 Technique to replace your teeth in one day. They will provide an acrylic bridge attached to 4 implants. Our practice also routinely provides the All-on-4 option. But what makes us different is that we offer more than one option for you – depending on your needs – including porcelain teeth, fixed and removable teeth, and a variety of implant types. We also encourage you to see us for routine follow-ups even after treatment is completed. In the past, Dr. Eskow spent several months working at a ClearChoice center. She wants you to understand that our private practice will offer you a more customized solution. Yes, we are currently accepting new patients. Please call the office to schedule a visit at 703-273-7846. 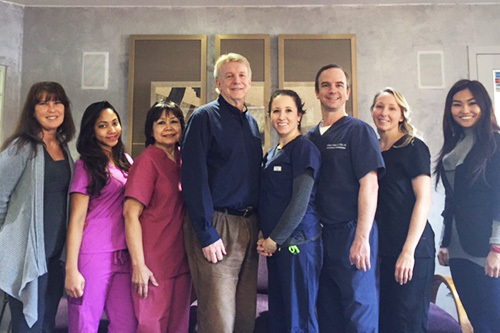 Unlike most dental offices, we schedule a significant amount of time with each patient. Therefore, we appreciate our patients making every effort to keep their appointments. If you cannot make it, please give us notice of at least 24 hours. We accept cash, check, and all credit cards. The cost of your treatment will vary depending on your individual needs and budget. We will discuss your options and costs before you begin, so you can make the best choice for you. We stand behind our treatment and will make sure you receive the dental care you deserve.